Nietzsche, displaying his trademark smile. 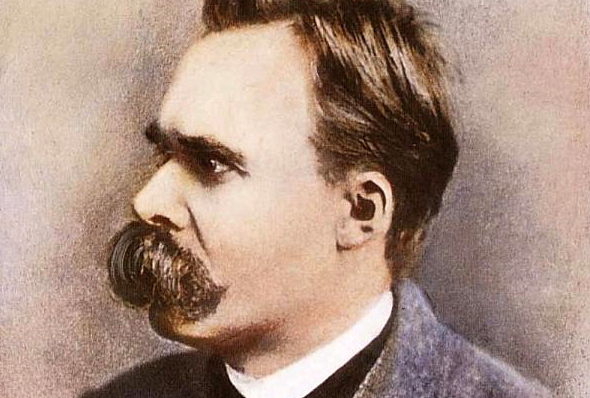 What would it be like if you dated, or lived with, German philosopher Friedrich Nietzsche? Wonder no more. A funny and clever video will show you! If you’re not familiar with Nietzsche, check out a great documentary and/or a helpful video that explains his critique of Christianity. The documentary is just under an hour; the other video is 24 minutes. Would you rather watch a three-minute video game starring Nietzsche, that looks just like an old Nintendo game? I thought so. Now that you’re primed, enjoy the show. At the very least, you have to watch until Nietzsche answers the phone. I feel for his roommate, Todd. His relationship with Nietzsche reminds me of a great show called I’m with Busey. In the show, one man—Adam—learns life lessons from another eccentric philosopher: Gary Busey. I love the first few minutes of this clip, especially when Lou Ferrigno and Busey hold Adam upside down over a balcony. Shockingly, the show failed to win any Emmys. What’s your favorite moment from any of these videos?